KATHMANDU, Feb 3: Number of complaints registered at the Commission for the Investigation of Abuse of Authority (CIAA) has drastically decreased last year as compared to the preceding year. 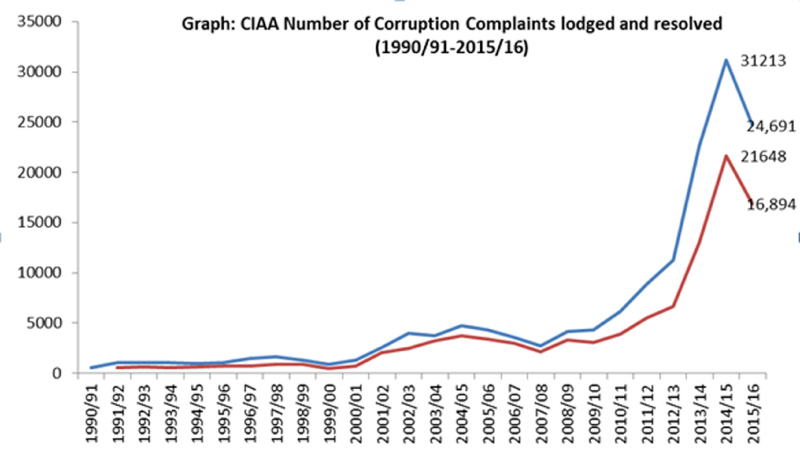 Along with the decline in complaints, the anti-graft body's efficiency to tackle corruption has also hit a record low, according to the details mentioned in a recent annual report published by the CIAA. The anti-graft body filed only 144 corruption cases at the Special Court out of the total 24,691 complaints registered with the CIAA in the last fiscal year 2015-16. Among the total corruption cases filed at the court, 52 were related to fake credentials while seven were cases of disproportionate property. Of the total complaints, 16,694 cases were internally settled. In the fiscal year 2014-15, CIAA had taken action against more than 8000 cases out of 31,213 corruption complaints while 21,503 cases were settled internally. The details provided by the CIAA show very nominal number of cases used to get registered at the CIAA until Suryanath Upadhyay came to power in 2002. This trend, however, decreased immediately after the formation of the Royal Commission. The graph shows an unprecedented increase in number of complaints after the commissioners were appointed in May 2012. "The removal of the terms 'improper conduct' from the constitution has also affected our investigation and its implications are seen in registration of corruption complaints," said CIAA Spokesperson Jib Raj Koirala. The constitution promulgated in September 2015 had curtailed the rights of the CIAA, barring the constitutional body from investigating 'improper conduct' of public officials. The removal was made after the then CIAA chief Lokman Singh Karki 'overstepped' his jurisdiction while investigating into the corruption cases. Improper conduct, which is generally defined as abuse of authority, is a lesser evil as compared to corruption, and its impact is huge in least developed nations like Nepal. CIAA officials believe improper conduct covers nearly 60 percent of corruption cases. Miffed by the lawmakers' move, CIAA officials have been demanding the concerned stakeholders to reinstate their power in the constitution. "The commission believes that the parliament and government of Nepal will take appropriate decision to expand the jurisdiction of the anti-graft body," acting CIAA chief commissioner Deep Basnyat apprised President Bidya Devi Bhandari during a briefing on Wednesday. Former commissioners of the CIAA, however, say the registration of corruption cases decreased not just because of weaker constitutional provision. "The institution could not gain public trust," said former CIAA chief commissioner Upadhyay, adding, "People registered maximum number of complaints immediately after the commissioners were appointed but they failed to win the hearts of the people." The number of corruption complaints increased significantly after Lokman Singh Karki was appointed chief commissioner of CIAA. Karki, who was appointed to the position at a time when the parliament was dissolved, initially vowed to do his best to control corruption but later was dragged into various controversies himself. Later, he was accused of abusing his authority to silence his opponents and benefit his family business and was subsequently disqualified by the Supreme Court. He was disqualified for not having 20 years of working experience as stated in the new constitution. An impeachment motion has also been registered against Karki at the parliament. Following the apex court order to disqualify him, Karki left the country. A writ petition has been filed against four commissioners Deep Kumar Basnyat, Nabin Kumar Ghimire, Sabitri Gurung and Ganesh Raj Gurung accusing them of not having 20 years of working experience as stated in the new constitution. Many suspect better performance of CIAA in coming days is over in the context that its chief has already been removed from the position and the institution has failed to gain the trust of the public. "It depends upon how the commission works. It is not so easy to boost the morale of a demoralized institution," said Upadhyay.